Samira Ahmed explores the rise and fall of the Lady Protectress Elizabeth, wife of Oliver Cromwell and a commoner who became 'queen' in the 1650s. 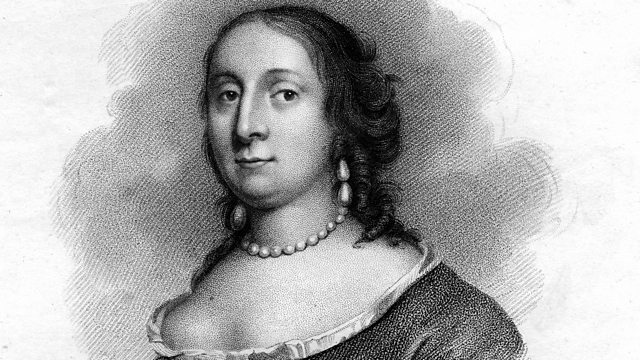 Samira Ahmed explores the extraordinary rise and fall of the Lady Protectress Elizabeth, wife of Oliver Cromwell - a commoner who became "queen" in the 1650s. Elizabeth lived through an extraordinary time - for women as well as men - as the country was divided by a decade of civil war in the 1640s. In the new regime that followed the execution of Charles I, Elizabeth found herself a consort like no other, an ordinary housewife elevated to Lady Protectress. But the Protectorate, and its efforts to forge a new kind of state power based on strictly Puritan grounds, lasted only a few years. In 1660, the monarchy was restored, Oliver's allies were executed as traitors and his own dead body was dug up and hanged in chains. The widowed Elizabeth, scorned and taunted, was forced to beg Charles II for mercy. So why is so little known about her? Helped by leading Cromwell scholars and tantalising historical documents - including a satirical cookbook - Samira goes on the trail of the fundamentalist queen, from the church where she married and her kitchen as the young wife of an MP in Ely, to the extravagant gifts that came to her Puritan court and the secrets that may lie within her anonymous grave. With Louise Jameson as the voice of Elizabeth Cromwell.